Technology has made just about everything faster and simpler these days, from how you hail a taxi to the way you keep in touch with friends and family. Of course, the same goes for dentistry. Your prosthodontist in Estero makes use of the latest tools and techniques to ensure procedures like implant placement are as comfortable and efficient as possible — keep reading to learn more about how the Cone Beam CT Scanner helps. For some complex oral procedures, the treatment planning phase is perhaps the most important step. When it’s time for dental implant placement, for example, a simple X-ray just is not sufficient to provide your dentist with the detailed image of your jaw and surrounding oral structures that is required for successful implant integration. 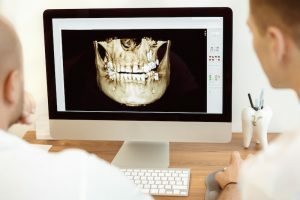 The Cone Beam CT Scanner offers a more comprehensive image than a traditional X-ray — and when your dentist has invested in this machine for the office, you won’t have to worry about going somewhere else to have it done. The Cone Beam CT Scanner is like a traditional CT scan, but it projects a different type of beam to successfully capture your oral structures. This scan makes visible the sinuses and nerves that run through your jaw all in one comprehensive image. Using this tool, your dentist is able to plan for precise placement of dental implant posts. It can be applied to a variety of dental implant methods, from traditional implants to computer-guided and more. As more and more dentists begin adding dental implants to their list of services, you need a few guidelines to ensure that you choose an office that will provide successful and long-lasting implants. By sticking with someone who offers the latest technology, you are setting yourself up for a comfortable and efficient procedure — and that is a big indicator of long-term implant success. In addition to the Cone Beam CT Scanner, you may also benefit from digital X-rays, which are ready instantly and expose you to less radiation in the capture process. Additionally, an intraoral camera is a tool that allows your dentist to show you precisely what is going on inside your mouth on a crystal-clear image located right at your chairside. Technology makes a big difference for complex dental procedures. As you search for a dentist in Estero for your dental implant placement, request a tour of the office or check out their website to make sure they are using the latest technology. If the answer is yes, that’s a great sign that you are visiting an expert in implant placement! The team at Pelican Landing Dental offers comprehensive dental services from the comfort of a state-of-the-art office. This practice is well-equipped with all the technology that leads to successful dental implants in Estero — like the Cone Beam CT Scanner and more. To learn more, you are invited to contact the office at 239-948-2111.